When we began our first-grade spelling lessons last year, it took me a little while to figure out that what we were doing wasn’t working for my daughter. Did she protest when I brought out her spelling book? No. Did she drag her heels and take forever to complete her work? No. Was she enjoying her lessons? Yes, she was. So what could possibly be the problem? While I want my children to enjoy their learning, a smiling face isn’t always the best indication of a successful learning experience. You see, learning has to actually happen! When choosing and planning our studies, I always consult my trusty copy of The Well Trained Mind. I’ve already mentioned that I love this book and it has greatly influenced my educational philosophy and material selection. I lean heavily toward the classical camp of homeschooling, but I also appreciate many of the other approaches especially Charlotte Mason. Anyways, I think that the WTM really misses the boat on this one. My copy, the newest edition available, recommends Spelling Workout. The problem we had using Spelling Workout was that there didn’t appear to be much rhyme or reason to how it was teaching spelling. And that it wasn’t really TEACHING anything actually. It seems to be your standard workbook and might work well for some kids who are already good spellers. But it failed to teach my daughter ANY spelling rules and suffice it to say that my daughter had zero retention of any of the material covered. I would hazard a guess that if the WTM is ever revised a fourth time it will recommend All About Spelling. I must say that I was totally wrong in believing that a child who reads well, loves books and is exposed to quality literature will automatically spell well. So after our SWO flop last winter, I started looking into other options. There is a lot of buzz in homeschool circles about All About Spelling. Everywhere I looked people were recommending it and All About Learning Press’ reading curriculum All About Reading. I hesitated in purchasing the curriculum though, for two reasons: the first being that I had never seen or handled the curriculum myself; and second that it is a very costly program. Spelling Workout A can be purchased for $18, and each subsequent workbook is approximately the same cost. To get started with AAS in comparison, you need to plunk down $29 for a starter kit and then $38 for Level 1. Subsequent levels are in the ballpark of $50 each! 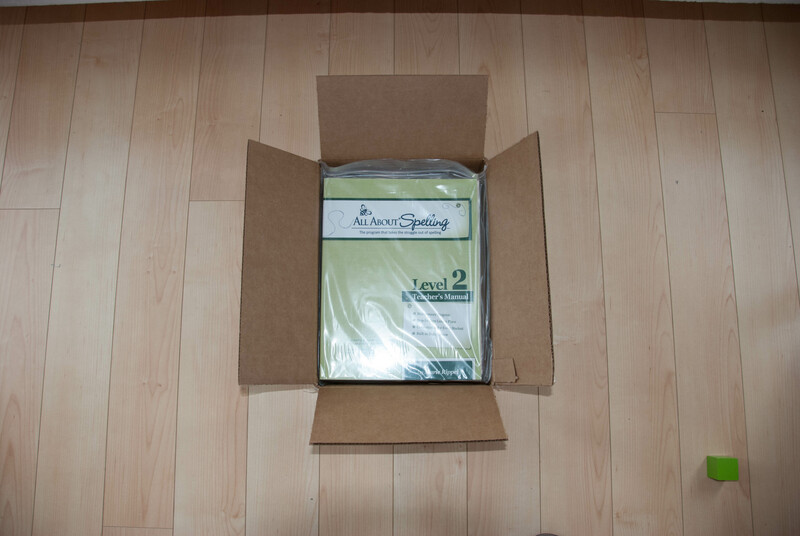 And then you have to factor in shipping from a curriculum supplier as it is not available on Amazon. So I spent the winter trying to do spelling on my own. I have zero knowledge of spelling rules and am myself not a great speller. 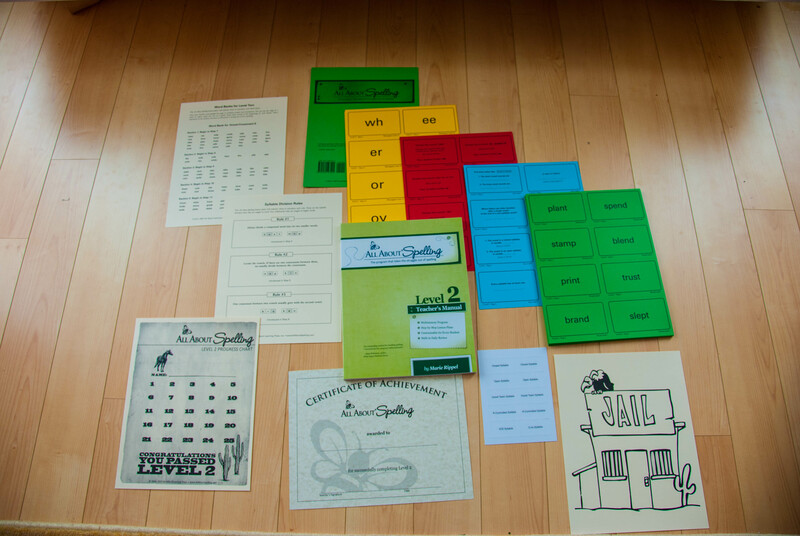 There are graded spelling lists available online, and these I taught in the method commonly in use in public schools (according to a friend who is both a parent of young elementary children and a public school teacher). At the start of the week, I would do a pretest. My daughter would get approximately 5-7 out of 10 words correct. On day two she would copy the words. On day three she would alphabetize the list. On day four she would build the words with letter tiles. I was trying to add some multi-sensory experience to our learning a la AAS 😉 I used these tiles. On the final day, I would re-test her. 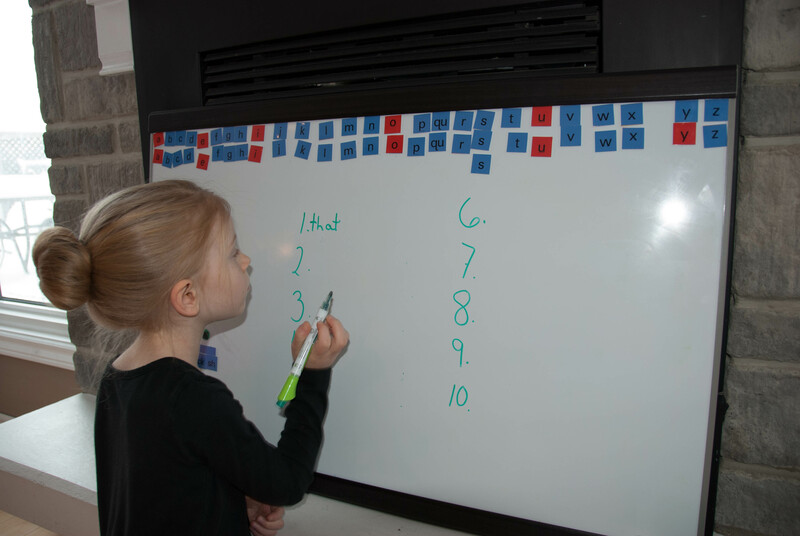 And this is where it got interesting – she would get the same or almost the same score as she had on the first day BUT SHE DIDN’T ALWAYS SPELL THE SAME WORDS WRONG! She was often spelling words incorrectly that she had previously gotten right. And vice versa. So after several months, we quit spelling altogether and I just kept thinking about AAS. We begin each lesson by reviewing our Phonogram Cards, Sound Cards, and Key Cards. Then we review 10 spelling words from our cards in the “mastered” section. I try to shuffle them well so there is a good mix of all the recent rules we have learned. Pleased with her hard work! Next, I demonstrate the new teaching using the letter tiles. The letter tiles are really great – read all about why they are so great on the All About Learning Press Blog. Then my daughter practices a few words using the tiles. The instructor’s guide specifies that the student is to spell all 10 words in the list using the tiles before moving on to writing them by hand. 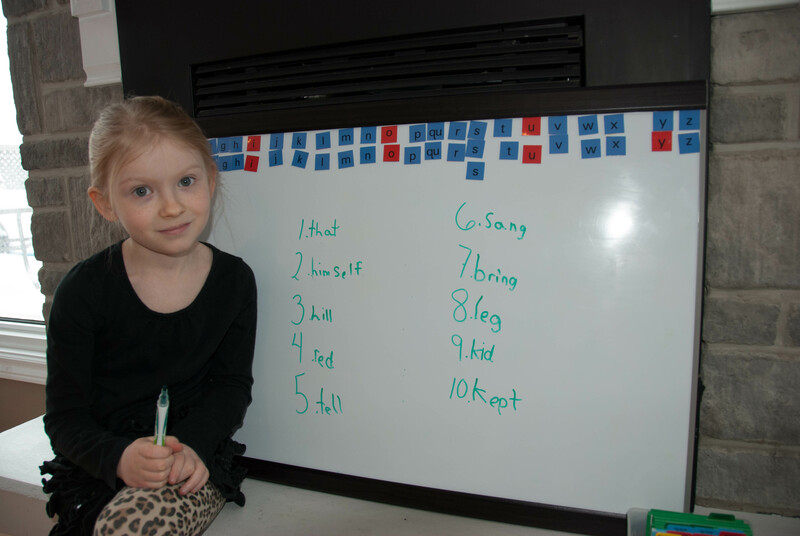 Since my daughter is finding the words really easy and doesn’t like using the tiles very much, I allow her to move along quite quickly to writing. She loves the dry erase markers! After learning the new concept using the tiles, we practice with the markers. Today we learned to make words plural by adding s or es. 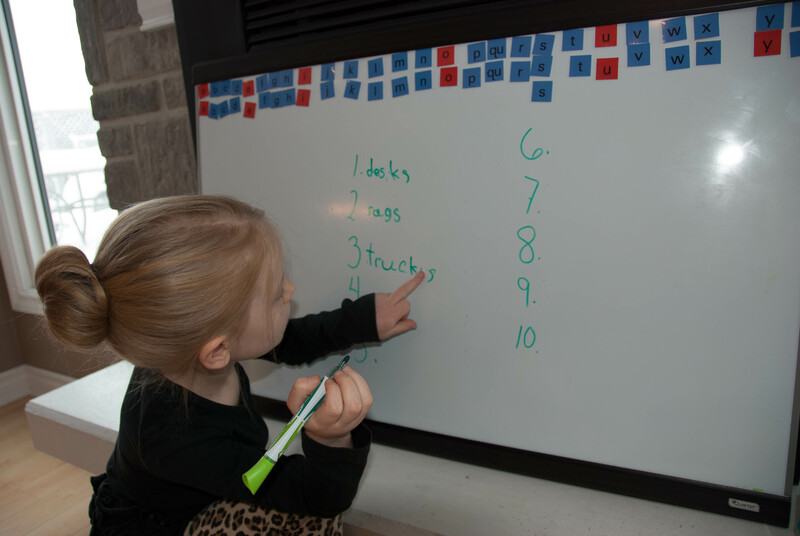 Here she is erasing the e she added in error to the word “truck”. The last step in each lesson is dictation. At this point I dictate to her a few of the phrases, she repeats it back to me and then writes them down. This is working really well for her as we have just begun dictation in both our writing and grammar programs. And when we are all done, my daughter enjoys making a picture out of the words! 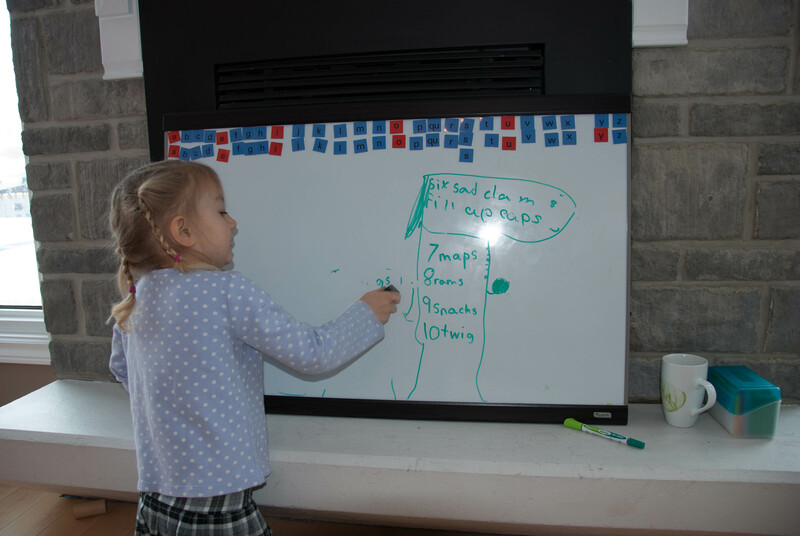 She decorates the board to her heart’s content and then little sister has the fun of erasing the whole thing. And just in time, look what came in the mail this week! Level 2 & 3 which I ordered from The Learning House: Here is the whole Level 2, complete with all the cards I get to separate and assemble into my review box. I didn’t get to do that last time as the previous owner had done it for me. My daughter is curious what the “jail” is for. Is it for words she keeps spelling wrong? Or is for words that break the spelling rules? We will soon find out! And it is worth noting that this curriculum is quite popular and holds it’s value well so I should be able to resell it when we are done. It is almost completely non-consumable as well, with the exception of the progress charts and certificates, which we don’t use anyway. So the cost of the program will be spread out between my three girls. I would have had to re-purchase SWO workbooks for each child, so in the end, this one might actually be cheaper, and re-sellable! Update: I’ve now been using AAS for several years and am midway through Level 4 with my oldest (fourth grade) and preparing to start my first grader. It’s an excellent program — and it is now included in the recommended resources for the fourth edition of The Well-Trained Mind. My daughter used to love drawing pictures around the words too! Great job on the review and pictures–what a cutie! We use All About Spelling as well. My daughter finished level 7 in the middle of 4th grade last year, so we then ordered Spelling Workout for continued practice since I didn’t want to stop working on spelling so early. She’s a great speller, so it’s working out for her. Like your daughter, she really enjoys it, but thankfully she has the skills mastered from All About Spelling. My boys are currently in levels 4 and 2 and they enjoy it as well. All three of my kids dislike the letter tiles like your daughter. 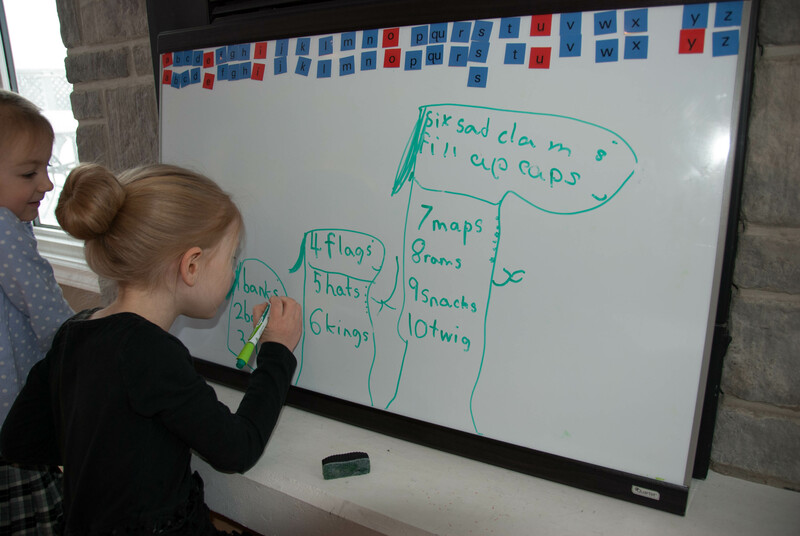 I will use them at times to introduce a concept (I actually use them not the kids), but when it comes to the child practicing spelling, out come the dry erase markers. They don’t like how long it takes to use the tiles when writing is so much faster. I just thought it was my kids since everyone else seems to love them. It was fun reading your review! Yes, the tiles really slow things down! We are still at the point where we are breezing through the lessons, doing 2-3 steps a week. It would take us much longer if we were spelling all the words with the tiles. I can see how it would work well for the early levels with the younger ones. My daughter loved using letter magnets when she was learning to read at 4-5. Thanks for stopping by Brandi! during this year DS 1st grade we did the same switch! We are doing SO much better with AAS and mastery is finally happening. Good to know I’m not alone, even though I love WTM recommendations AAS is a huge success for us. I’m sure if AAS had been available when the last edition of the WTM was published it would have been included as a recommended resource. I’m very pleased with my decision to switch, we’re almost done level 2 and I’ve already purchased levels 3 & 4! We used Spelling Workout this year but I think we’re going to switch for next year. In addition to a standard phonics program we used in Kindergarten last year, I decided to use the ABEKA Handbook for Reading for phonics review. My daughter loves the ABEKA readers and the Handbook for Reading pairs up with those. I found that the Spelling Workout book approached some of the phonics differently than ABEKA. So I think that for next year we may either use ABEKA for spelling or use the Explode the Code workbooks that we have left to complete and just use each lesson’s words for spelling too. I’ve not had any experience with Abeka’s products, but people love them and they have been around for a long time! It is nice when programs work well together, inconsistencies are confusing to kids. I’m finding that AAS worked well after coming from Ordinary Parent’s Guide to Teaching Reading, and now I’m even using the tiles from AAS WITH OPGTTR with my 4 year old. We had the same experience, all the way from WTM to SWO to AAS. My DD is a strong reader, but her spelling was awful. We went through all of SWO and I don’t think she learned a thing. We started AAS in February, and I think we might make it through Level 1 this year. If not, oh well, at least she is actually mastering the material. I am confident she will be on target by next year. Thanks for sharing! I can’t say enough about AAS! It works so well! Thank you for sharing this! I’m in search of a spelling curriculum and was just about to go with Spelling Workout after consulting The Well-Trained Mind but then I came upon your post and am so glad I did. I’ll have to look into AAS again. We have level 1, but I haven’t worked through it yet. It looks like we have similar goals for our homeschool. I’ll have to come and check out more of your blog soon. I’m so glad you found it helpful 🙂 I’m anxious to see the new edition of TWTM in the fall, and what the new recommended resources are. Some people really like SWO, but there are much better resources available now IMO.